← What went through my during the Gospel this morning? As you know, the TMSM has obtained a new-old hearse. THANK YOU, MB, for the generous donation! A Tenebrae hearse is a pavement standing candelabra with 15 candles. 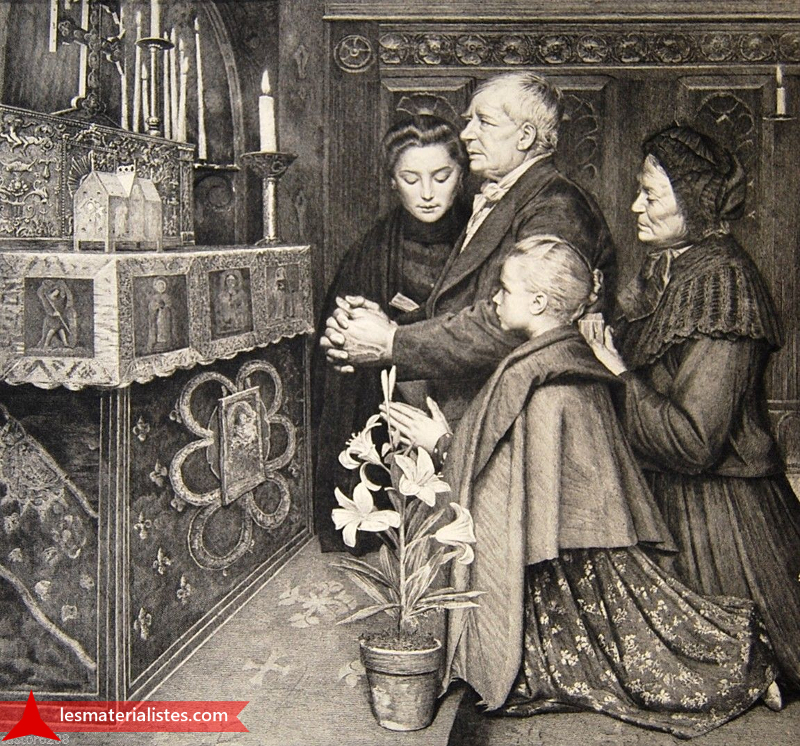 After each psalm of Matins and Lauds a candle is snuffed until just one is left. It will be removed from the hearse at the end of Lauds as the final antiphon is sung. Then the schola pound the stalls or benches until it is brought back and placed, like the resurrection, atop the hearse again. The word “hearse” comes from ancient Oscan hirpus (wolf… which has rows of teeth), and then into Latin hirpex (a large rake… which has rows of teeth), and then into Anglo-Norman French herce (a harrow – a heavy frame with teeth which is dragged over plowed land to break up clods, remove weeds, etc., and also for a large chandelier of a church or a framework for candles hung over a coffin). So, a Tenebrae hearse is so called because it looks like a big rake with candles for wolfish teeth… all the better to see you in the “shadows”. I just noticed in one of the headers that rotate through the blog’s pages, that there is a hearse in the background! It isn’t a tenebrae hearse, however. 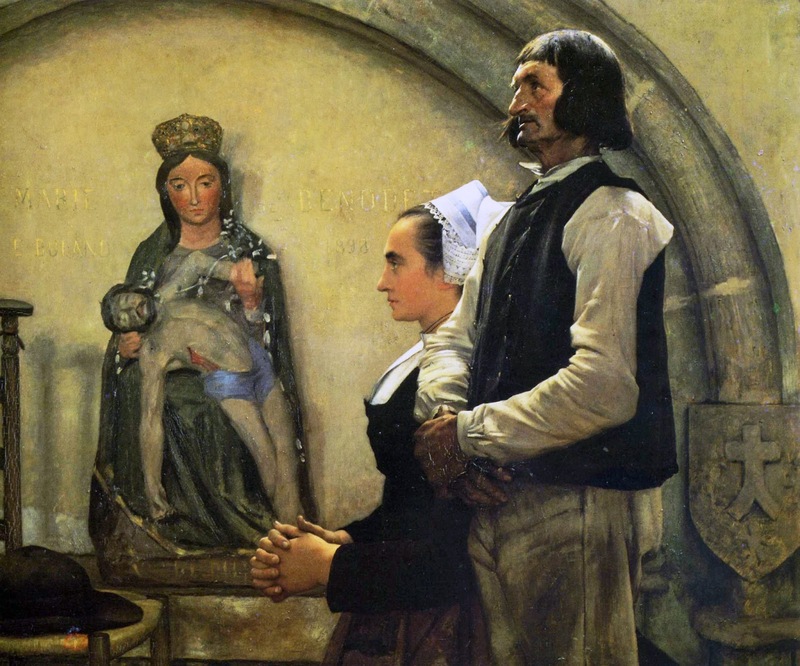 This is a detail from a 1885 painting “La Restitution à la Vierge le lendemain du mariage” or “Offering to the Virgin the Day After the Wedding” by the naturalist Jean-Eugène Buland (1852–1926). It hangs in the Musée des Beaux-Arts de Caen. There are lighted candle on the hearse, used for devotional purposes near the picture of Mary that is tacked up on the wall. The altar cloths don’t reach the floor on either side. It could be that this Marian side altar is used as the altar of repose. Also, there is only one step. Mister’s hat is on the bench, the opening upward, which is correct. The side bench has pew tax numbers, though the others don’t. The older woman, Maman, in the pew has her well-worn prayer book open. She wears a crucifix and perhaps another religious medal on the longer chain. Have they been there for a while. On the bench next to Mister, is a prayerbook and what looks like a white rose. He has one in his lapel. Maman doesn’t look overjoyed and Papa is stoic. Mister is looking a bit … what?… apprehensive? But this is after the wedding and the wedding night. Right? Missus, at the altar isn’t overly thrilled either. She has taken off her shoes. As if going to the burning bush… barefoot. Of course lay people didn’t usually go up to the altar. Barefoot. I think she’s pregnant and this was, perhaps a quickly arranged marriage. 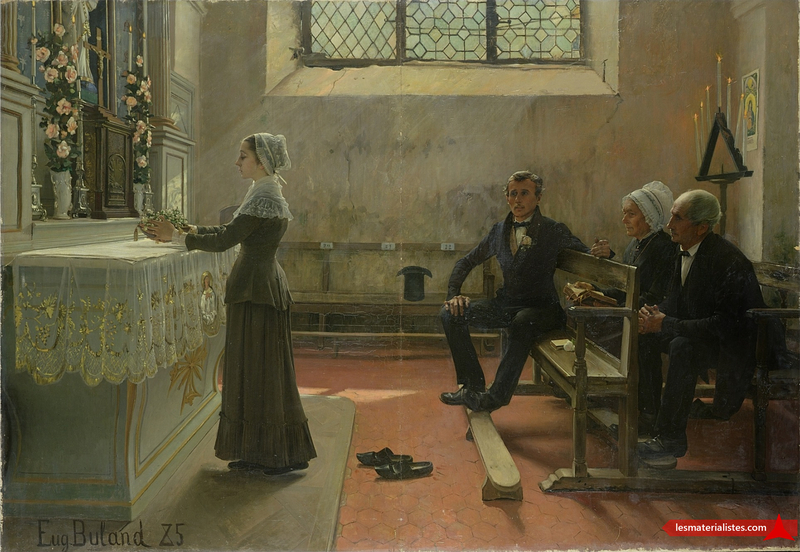 His painting “Alms of a Beggar” has wedding imagery and drips of irony. 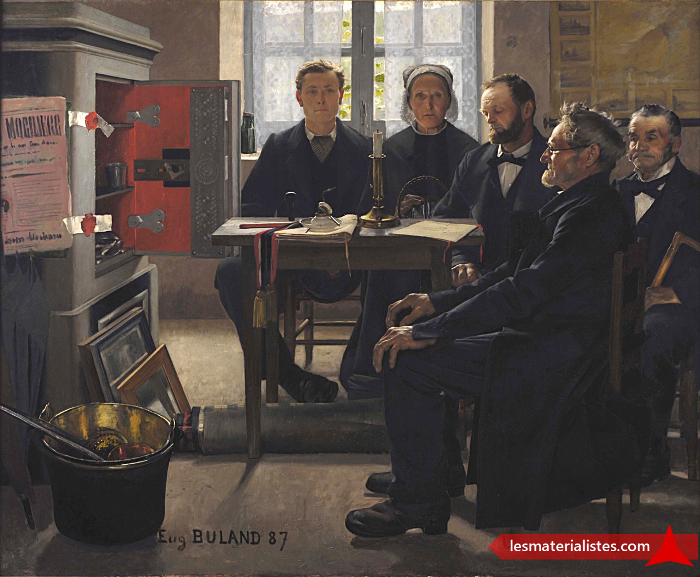 Buland has something going on in his paintings. As does THIS. And … wow… THIS. This entry was posted in SESSIUNCULA and tagged header, hearse. Bookmark the permalink. 4 Responses to A detail in a detail in a header on this blog and some details about a liturgical detail. Buland is impressive, particularly Alms of a Beggar. There is a story in that old man’s face. These are lovely. 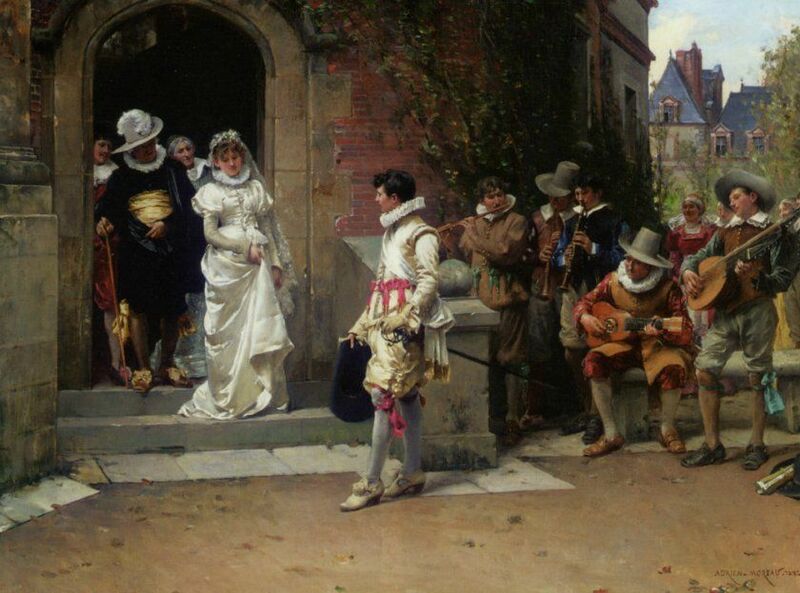 The young bride’s eyes are downcast, she may be feeling contrite. Such skill in these paintings. I don’t understand the last one, it’s also beautifully done but what is going on. I read the scene in a completely different way. The focus of course is the bride, who has set aside her virginity and is squaring her shoulders to the responsibilities of her new life. She knows now how much she will need help from the wise Mother of God when she becomes a mother herself. She and her husband carry white roses, signs of fidelity and of the Virgin. It is the moment of realization for both of them. Whatever may happen, they are bound for life. The husband looks a bit stunned by this realization and he is a little bewildered. The wife he married is not quite the maiden he wooed. And then there is her family. Mom and Dad are subtly turned toward each other. Years of partnership have attuned them so closely that no words are necessary. They look toward the young people but they are really seeing their own days of youth and strength and ignorance and the hardships they endured together with the help of Our Lady. I suppose “Victorian” customs might have bled over to the Continent (or vice-versa)?